Millennials are the future of your business. How can managers and leaders of organizations better engage them to gain a competitive advantage? Millennials have been burdened with a reputation as spoiled, lazy, and entitled, but the reality behind the stereotype is far richer and more complex. Who are Millennials and what do they really want? This essential book explains who Millennials really are, and offers practical advice to help those who manage, lead, and work with Millennials to improve teamwork, increase productivity, strengthen organizational culture, and build a robust talent pipeline. Based on fieldwork and survey data from global research on more than 25,000 Millennials and 29,000 older workers in 22 countries, this book paints a comprehensive, scientifically accurate picture of what really motivates Millennials around the world. ORDER What Millennials Want from Work: How to Maximize Engagement in Today’s Workforce at Amazon. More than ever, data drives decisions in organizations—and we have more data, and more ways to analyze it, than ever. Yet strategic initiatives continue to fail as often as they did when computers ran on punch cards. Economist and research scientist Alec Levenson says we need a new approach. 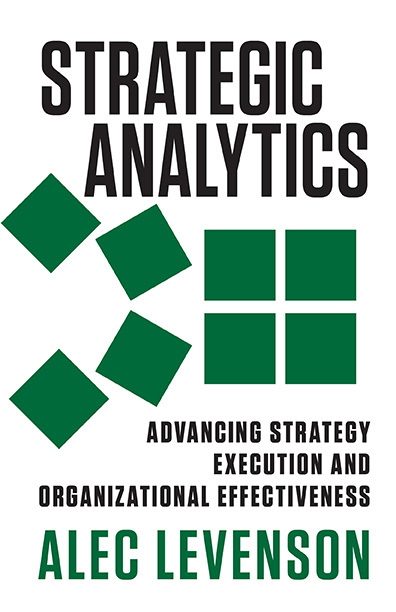 ORDER Strategic Analytics: Advancing Strategy Execution and Organizational Effectiveness at Amazon. Alec Levenson discusses using analytics strategically in HR. PURCHASE Employee Surveys that Work at Amazon. Around the time the millennial generation started flooding the workforce, alarms were sounded. Managers were told to be wary of these 20-something new hires, who were likely to jump ship at the first whiff of something better. More recently, however, studies have started to dispel the myth of the itinerant millennial. Using data from the U.S. Bureau of Labor Statistics, for example, the website FiveThirtyEight.com has shown that millennials change jobs less frequently than gen Xers did at the same age. Read the entire article at strategy + business. Alec’s DVD, Managing Millennials: Getting the Most Out of On-Boarding, Managing and Retaining Millennials, is now available for purchase from Stanford Press. Click to see an excerpt from this DVD. Managing millennials is becoming an increasingly important topic for organizations. In this talk, Alec Levenson distills the results of his research into the latest generation of employees entering the workforce. Are the millennials really as different as they’ve been described? How can employers better understand them? Alec offers some important insights from his research. Read Alec Levenson’s thoughts on the relationship between firm performance and employee engagement, and why the relationship may not be as straightforward as it may seem. The move toward “big data” has enabled companies to making large advances in understanding their customers and markets. Now we hear many people advocate for “big data” for HR. How much is hype versus reality? Where are the insights going to be? In this article I review recent big data developments and map out the likely paths for HR. Organizations have always wrestled with the most effective ways to expand internationally. Today the greatest opportunities for growth lie in the large emerging markets of China, India, Indonesia, Brazil and other medium to large size developing countries (Mexico, Turkey, South Africa, Vietnam, Philippines, Egypt, Nigeria, etc.). The lessons previously learned about working cross-culturally apply equally well to these markets. Yet the challenges of succeeding in these markets are unique compared with the conditions a generation ago, when companies expanded into North America and Europe. Today’s emerging market economies are at earlier stages of economic development, their scale is larger, and the global business environment is much more dynamic. In this article I address the challenges multinational companies (MNCs) face when trying to succeed in these markets, paying attention to issues of business strategy, organization design and talent strategy. I take as the starting point Bartlett and Ghoshal’s transnational strategy and discuss the implications of applying it in a large emerging markets context. The discussion draws lessons from recent market developments in these economies, and the experiences of companies operating there, including action research projects I have conducted in China, India, Brazil, Indonesia and South Africa. This chapter covers analytics for evaluating the impact of training and development (T&D). There is a literature on measuring T&D impact, starting with Kirkpatrick’s classic model and ROI calculations promoted by Phillips and others. I take a different approach, using analytics of T&D to inform not just program measurement, but also program design and implementation. The approach can be used to improve T&D impact even when direct measurement is impractical. an alternative to T&D. To provide maximum actionable insights, the analytic approach should address whether and how the program design supports business impact. Despite the apparent progress in recent years, there still is much uncertainty regarding how best to design, apply and integrate analytics into the daily workings of the HR function. The challenge lies in understanding what analytics to apply where, and the time and resources needed to achieve true insights. This article discusses the variety of analytics and skills that can be used to achieve business insights related to HR and talent. Case study examples illustrate the importance of matching the analytic method to the issue under study. This deep examination of the careers and aspirations of the current and former employees of PricewaterhouseCoopers is an example of the power of independent, rigorous research to drive change in a large organization. The findings demonstrated the need for a much more integrated approach to retaining mid-level professionals. Whereas before many managers and partners had simplified the turnover problem to a compensation issue, the data allowed firm and HR leaders to make the case for making broader changes to address job assignments, careers and work-life balance in the firm. Partners saw the need to address work-life balance and career growth and committed themselves to serious changes in the culture and staffing practices at PwC. The case also demonstrates the importance of taking a broad view of total rewards that includes aspects of the job beyond compensation and benefits. The nature of the work itself, and what that means for professional development, work-life balance and career success can exert equally strong, if not stronger, influences on motivation and retention of employees, including those with the highest productivity and potential. Carefully constructed and rigorously implemented analyses that measure the importance of competing factors — both compensation-related and non-compensation-related — can reveal where the real ROI lies that supports lasting and effective change. In 2005 Frito-Lay’s senior executive team faced a challenge with their Route Sales Representatives (RSRs). The company was achieving sales and profitability targets. But high turnover and low productivity among the RSRs had made the task of meeting those targets progressively harder over time. Tired of having to resort to “cheerleading” to meet each quarter’s numbers, line managers and human resource professionals came together in an effort to see if they could identify solutions that could provide bottom-line results that were both cost effective and sustainable. However, they immediately ran into a brick wall: What was the cause of the low productivity and morale issues? To find the answers, members of Frito-Lay’s HR team, in partnership with researchers at the Center for Effective Organizations, launched a study of the drivers of attraction, retention, motivation and productivity for the RSRs. The analysis produced actionable results that Frito-Lay used to improve job performance and business results. This case is an example of targeted, focused use of data. This case demonstrates the importance of problem focused use of measurement and analysis, including creating custom measures that are not necessarily to be used as ongoing reporting metrics. The takeaway for HR professionals in other organizations is the importance of tailoring measures to fit the issue being addressed. The “right” human-capital measurement tools cannot necessarily be found in turnkey software solutions. More importantly, the job-design analysis capability that Frito-Lay HR professionals used to help design and carry out the analysis is in short supply in the HR functions of many organizations. Building job-design capabilities into the HR toolkit offers potentially high return on investment for any organization looking to improve the efficacy of its human-capital management. This article addresses the conceptual and methodological issues involved in measuring the business impact of executive coaching. A framework is introduced for identifying the business impacts of coaching. An application of the framework is presented using exploratory study data from 12 matched coach-coachee pairs showing varying degrees of impact of the coaching on business-related outcomes. The primary conclusion is that the degree of business impact likely is related to complexity of the executive’s role, and to the relationship between the organizational environment and individual performance. The implication is that coordinating executive coaching with other leadership development, performance improvement, and rewards initiatives should increase business impact. This article uses an economic approach to address whether and how the Millennial generation is significantly different from its predecessors. Particular attention is paid to the normal life cycle stages through which all generations pass, and the implications for forecasting how the Millennials’ relationship with the world of work will evolve. A second key issue is the extremely large differences in economic opportunity that exist among the members of each generation, and which have increased for more recent generations, particularly those with lower levels of education. Other key issues include the rise in international competition for jobs, and the rising cost of a college education. These factors together imply that simple stereotypes about Millennials taking a privileged view of the world of work may be simplistic at best, and likely are significantly off target. Occupational dissimilarity is a measure of the overlap in education, skills and experience across two disciplines. Though occupational dissimilarity is not directly addressed in the organization design, careers, and other literatures, it plays an important role in organizational effectiveness. Specifically, integrating tasks when occupations are dissimilar is quite difficult, which can hinder successful strategy execution.When two or more dissimilar functions play key roles in the value-creation process (for example, R&D and sales), the risks to organizational effectiveness are particularly acute. In these cases there are no natural tendencies for individuals to develop cross-functional skills, and traditional integration approaches typically include only formal mechanisms such as general manager development and cross-functional teams. Organizations should more actively focus on ways to foster cross-functional skills at the individual contributor level, not just general manager level, in such cases. Examples from logistics, consumer product analytics, and services procurement/business process outsourcing are addressed. Implications for organizations operating in emerging markets with large consumer markets but underdeveloped talent markets are also explored. For a more complete list of publications, please see Alec Levenson's C.V.